Tomorrow's News Today - Atlanta: Will Schlotzsky's Be a Winner on Lawrenceville-Suwanee Road? 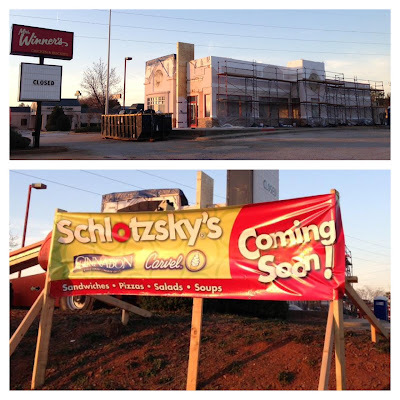 Will Schlotzsky's Be a Winner on Lawrenceville-Suwanee Road? Atlanta-based Focus Brands is bringing Schlotzsky's, Cinnabon and Carvel to a former Mrs. Winner's in Suwanee. The multi-concept restaurant will open in place of a shuttered Mrs. Winner's Chicken & Biscuits on Lawrenceville-Suwanee Road, near Interstate 85. Plans call for the existing restaurant to be reshaped to create the Schlotzsky's concept with a planned opening in early May. Interestingly, Russ Umphenour, currently president and CEO of Focus Brands, was once owner of Mrs. Winner's though his RTM (Results Through Motivation) restaurant group. Cinnabon, based in Atlanta, will feature its Cinnabon Express unit in tandem with Austin, Texas-based Schlotzsky's and Carvel's Carvel Express. According their website, Schlotzsky's currently has eight metro locations including restaurants in Dunwoody, Marietta and Duluth. According to their website, Carvel currently has five locations in Atlanta, two of which are co-branded, one with Schlotzsky's, the other will Moe's Southwest Grill, another Focus Brand. According to its website, Cinnabon has five locations in metro Atlanta, with 17 overall in the state. I recently heard Cinnabon's President Kat Cole speak and learned that Cinnabon's future growth will be aligned closely with that of its sister concepts Schlotzsky's and Carvel. Plans call for many more units of Cinnabon "Express" and Carvel "Express" to be located with new and existing dining concepts like Schlotzsky's and Moe's. Schlotzsky's faces stiff competition in growing their Atlanta presence from the likes of Jason's Deli, Which 'Wich?, Panera Bread and others. A location on LaVista Road in Tucker closed over two years ago and I'm not quite sure how they've managed to hold on in Dunwoody where they are just yards away from Jason's Deli. With any luck, the redevelopment of the Mrs. Winner's will draw interest to its neighbor, an abandoned Burger King restaurant. Personally I think the parcel would be great for Del Taco, a California-based chain that previously partnered with Mrs. Winner's but has been expanding locally on its own. As far as Mrs. Winner's goes, there have been a number of locations reshaped or redeveloped over the past few years for a variety of uses. In Decatur, Advance Auto Parts recently built a new store on place of Mrs. Winner's on Lawrenceville Highway. McDonald's opened a restaurant in place of a Del Taco/Mrs. Winner's co-branded restaurant on Cotillion Drive in Dunwoody. I think this will be DOA. That property is almost impossible to get to. Mrs. Winner's seems to have given up on the Atlanta Area. I don't think they have any locations left here. Their chicken was not as good as it use to be the last time I eat there. It's simple...they survive in Dunwoody because they have a different product than Jason's offers. Believe it or not, different concepts of a similar genre can survive in Atlanta. The Schlotzsky's in Alpharetta has survived for many years, even with stiff competition from Jasons, Panera and numerous independent sammich joints. But then again, the competition isn't close by. I'm not a huge fan of Schlotzsky's, but they no doubt have a following. Winner's is totally gone now, except for a handful of franchises left in North Carolina. The company would have done better to just sell its biscuit recipe to CFA -who sells a dreadful biscuit- and be done with it. The Schlotzkys in Hapeville is only busy at lunch, and then not always. Not impressed the couple times I've eaten there. The last time, one of the cooks was opening a mayo jar with a knife by stabbing the jar. Something to do with needing to pour the mayo into a squeeze bottle. I don't know and don't care. Not going back.